Basically, this is all the stuff that doesn't fit in another section. Most of all, while the rest of the site is more of a reference work, this is about actually owning and using a Star firearm. Not entirely, but mostly. Because of this vague definition, expect things to move in and out of this section. All guns are always loaded (until you establish whether they are or not). Never let the muzzle cover anything you are not willing to destroy. Keep your gun pointed in a safe direction at all times: on the range, at home, loading, or unloading. Keep your finger off the trigger until your sights are on the target (and you are ready to shoot). Be sure of your target. Know what it is, what is in line with it and what is behind it. Never shoot at anything that you haven't positively identified. Most importantly, use the correct ammunition. A number of these weapons can chamber and fire ammunition that they were not designed for. In some cases this can be extremely dangerous. In many cases, the original cartridge is no longer made, or no longer available in the original loading. If you reload, keepin mind the age of your gun and don't exceed the original specifications. Remember the age of your firearm. Older weapons should not be used with maximum loads. Additionally, some weapons will fit and fire cartridges that are expressly dangerous. One of the more common ones is the ".38" marked on the slides of guns usually before 1930 or so. The .38 on the slide refers to .38 ACP and not the more modern and common .38 Super. The Hornady manual says it better than I can: "The 38 ACP became obsolete in 1929 when Colt introduced the more powerful 38 Super Automatic, an improved version of the .38 ACP loaded to much higher pressures. The cartridges are identical in appearance, but the Super version is dangerous if fired in handguns designed for the original cartridge... Under no circumstances should 38 Super factory ammo or top equivalent reloads be fired in weapons chambered for the older 38 ACP." Safe to shoot in old guns? Here is some more information on the 9 mm Largo cartridge from people who should know, 9mmLargo.com. I believe one of their pages is a recipe for a bore cleaner to remove corrosive primer residue. Remember that cleaning supplies from the US in WWII, and current soviet cleaning solvents deal with corrosive ammo easily. Several products are available for purchase in the US for cleaning corrosive primer residue, so there is no need to go to the extremes of boiling water down the bore. Graf & Sons is distributing brand new loaded ammunition from Hornady in 9 mm Steyr. This is said to be interchangable with original loads of the 9 mm Largo, so is a great choice for that old pistol you may have laying about. Even better Hornady is making these up from newly manufactured components. That means the cases are reloadable, and new unloaded cases will also be available. This is brand new and semi-obscure, so either bug your dealer or contact Graf directly. Graf is also selling new Starline 9 mm Largo cases. This is probably the best deal if you want to load your own, of course. Long Mountain Outfitters has a stock of 9 mm Largo ammunition and also some really neat testing of the ammunition in different guns. They even sell it by date codes, so you can pick which one you want the most. SARCO has, as well as model B Super pistols and many parts, 9 mm Largo ammunition. They are also nice enough to declare which is corrosive and which is not. Non-corrosive is $25/100, $170/1000 or $320/2000. If anyone sees any more information on ammo, special deals or anything else, email me, and I will be glad to post and remove items as they change. Modern Star pistols are all very strong. The 9 mm Parabellum handguns are specifically designed to handle +P loadings. Most of these guns only shoot commom, modern ammunition. The warnings above regarding the power of 9 mm Largo do not apply, as B and Super B pistols can safely fire more powerful ammunition. However, there are still a few pitfalls. Make sure any used gun is in good condition still. The best is to have a gunsmith look it over as though its an old gun. You never know what may have happened to it before you got ahold of it. Also, lots of the B-series especially have been rechambered. Do not take the word of any markings on the slide of the pistol. The barrel may be chambered for a different cartridge, and this could cause dangerous issues. Also, be aware that much of the cheaper 9 mm Largo ammunition available is old surplus, so corrosive. Either do not shoot it, or you will have to carefully clean your barrel after each firing with a corrosive-residue remover; normal cleaning is not enough to protect your barrel. As far as I am concerned, the only condition a single-action, exposed-hammer pistol should be in when loaded is with the hammer to the rear, and the manual safety engaged. This is entirely safe, and there is no chance the pistol will spontaneously fire. Additionally, there are two key safety problems it avoids. When decocking a single-action pistol, nothing but your thumb prevents the gun from firing. Sooner or later your will slip, and put a hole in the wall, floor, your TV or your cat. If you are lucky. Guns designed to be decocked have decocking levers (and on these guns, use the decocker, never manually lower the hammer). But most importantly, for many guns including many still-common Star pistols, this is how the gun is designed to be carried. Aside from having no decocking facility, Star pistols are often equipped with direct-contact firing pins. When the hammer is down, the firing pin is in continuous contact with the primer. Any jarring can cause it to fire. The engineers never envisioned anyone lowering the hammer, so built this more reliable (vs. an inertial firing pin) system instead. 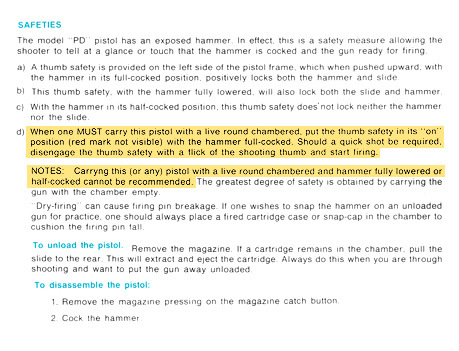 A Star manual (one of many) telling you not to carry with the hammer down. They go further into safety like all paranoid gun makers, and tell you to keep the gun empty all the time also, but note the reference to safety levers. That's how you carry a single-action pistol around.